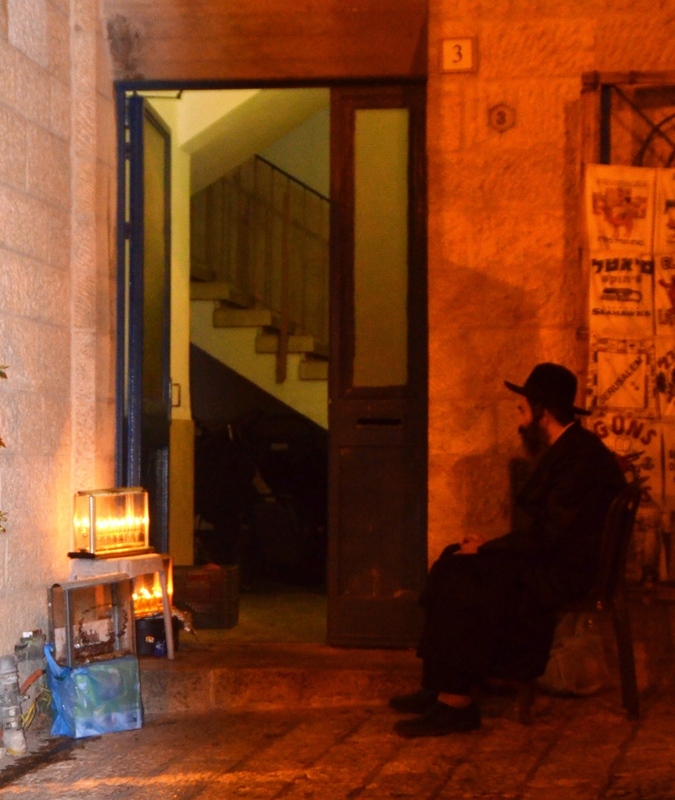 Eight days of Hanukkah in Jerusalem, Israel, are not enough. With so many things happening, one has to make a list and organize the time carefully. 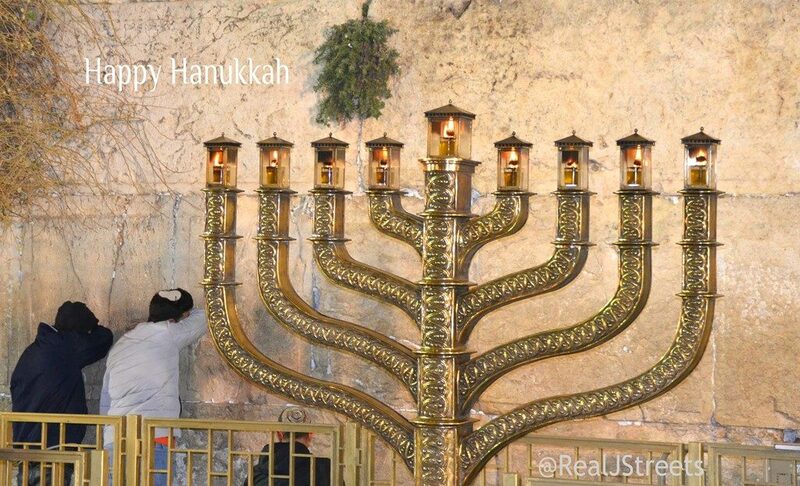 Lighting the large hanukkiah by the Kotel, the Western Wall, is a popular annual evening event. but it was a very private event on a different hanukkiah, shielded from the heavy rain and curious spectators. As usual, a large electric hanukkiah was lit each night of Hanukkah over the Knesset. 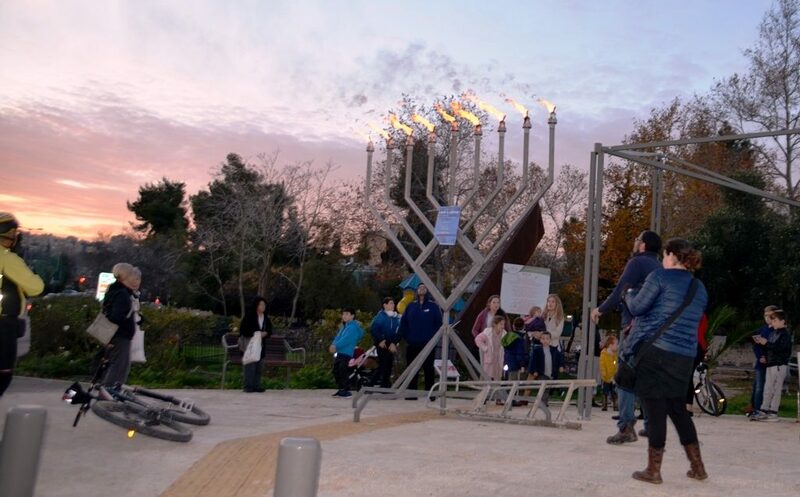 New this year was the hanukkiah erected on top of the Hadar Mall in Talpiot. Advertised as one of the world’s biggest Hanukkah menorahs, it measured 11 meters tall and 56 meters wide. 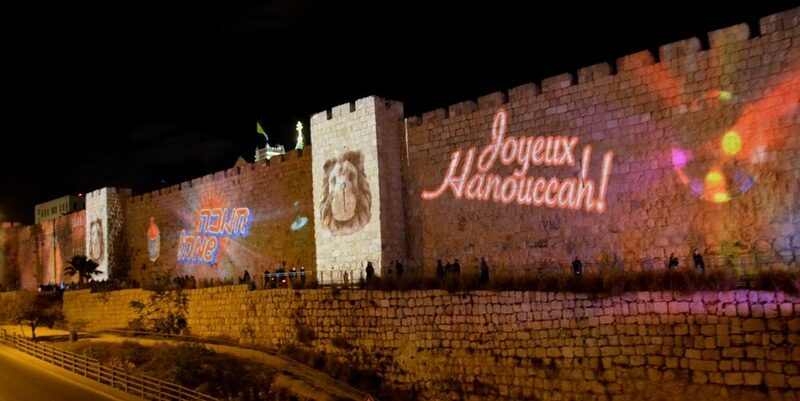 But Hanukkah candles are best lit in the home, as illustrated in this new projection on the Old City walls near Jaffa Gate. 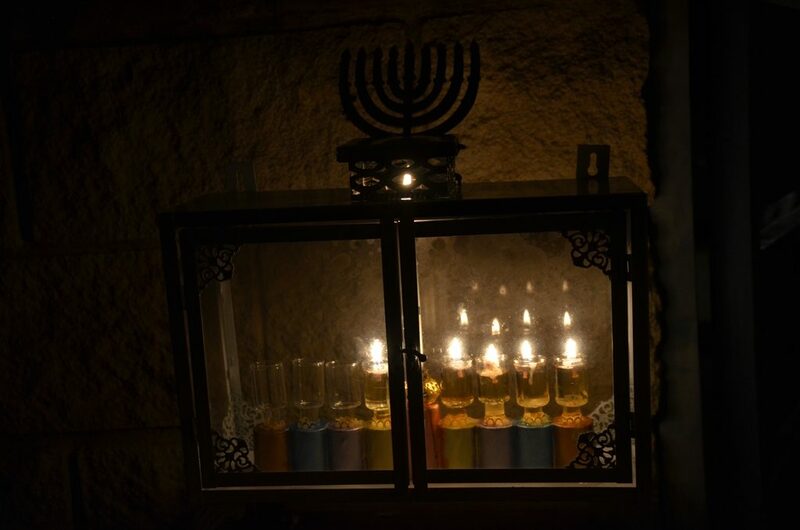 One of the most famous of photos of a Hanukkah menorah hangs on the wall at Yad Vashem, next to the real one displayed in a glass case. It shows a hanukkiah in the city of Kiel, Germany in 1932, with the Nazi flag flying across the street. 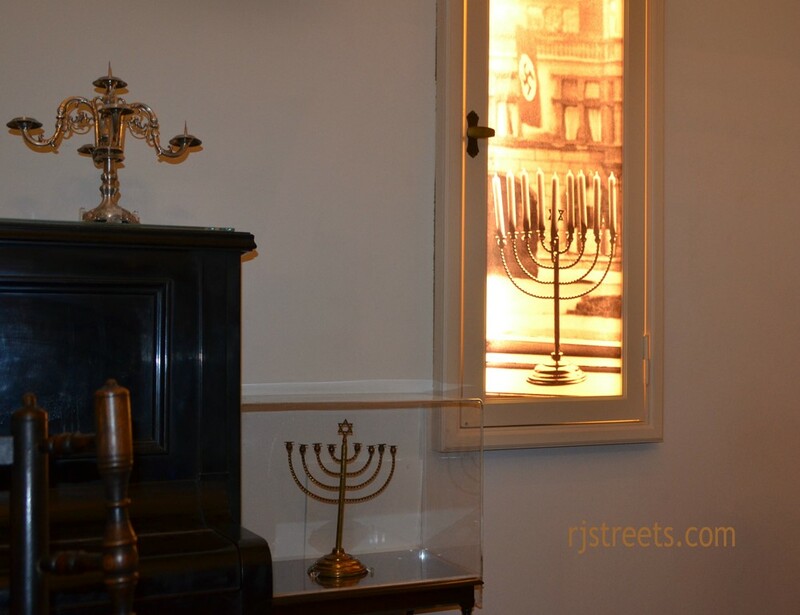 This hanukkiah is lit each year by members of the family that owned it, its lights burning on after the fall of Hitler’s Nazi Germany. 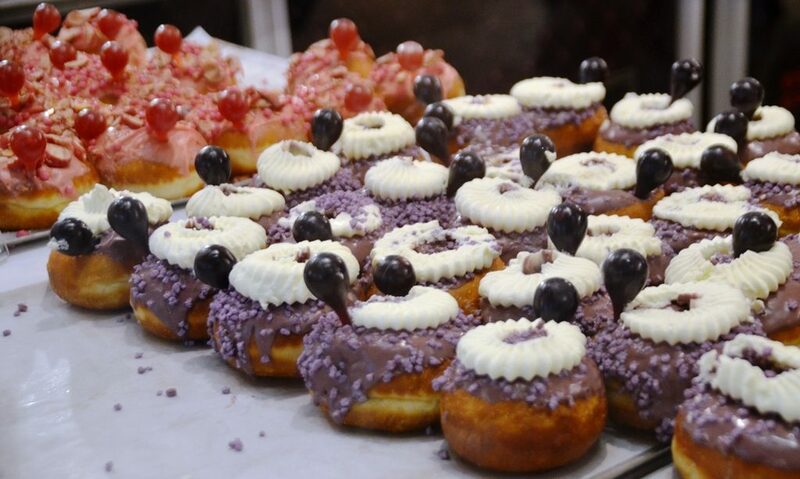 Before Hanukkah shops featured selections to satisfy every fashion and taste. 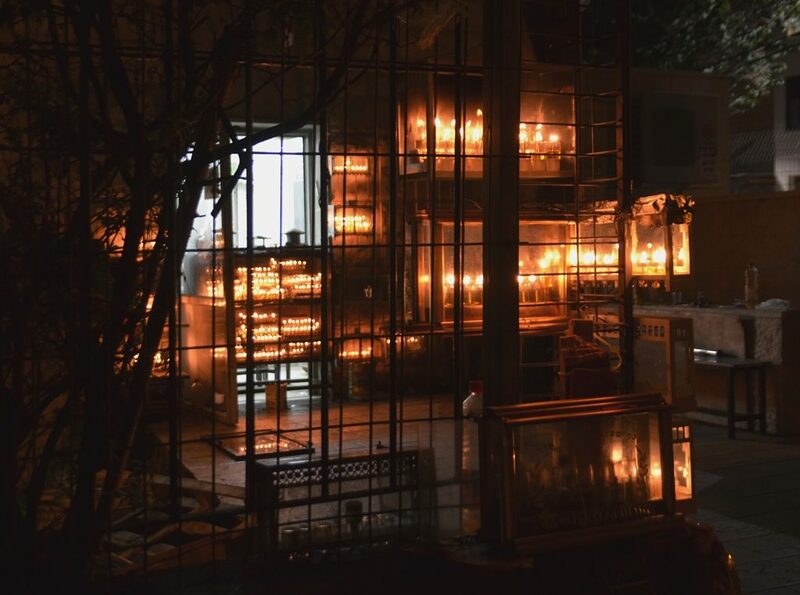 or dozens shining brightly outside a yeshiva dormitory. 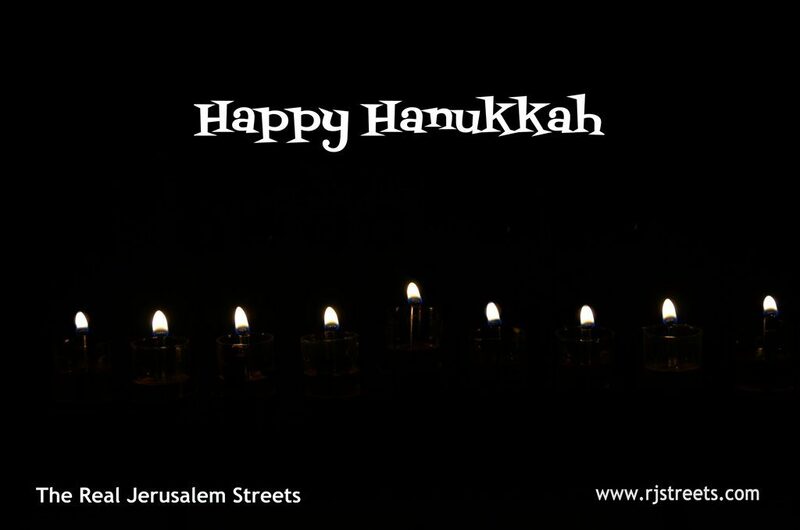 The idea is to show, share, and enjoy the lights in celebration of the miracle of Hanukkah. 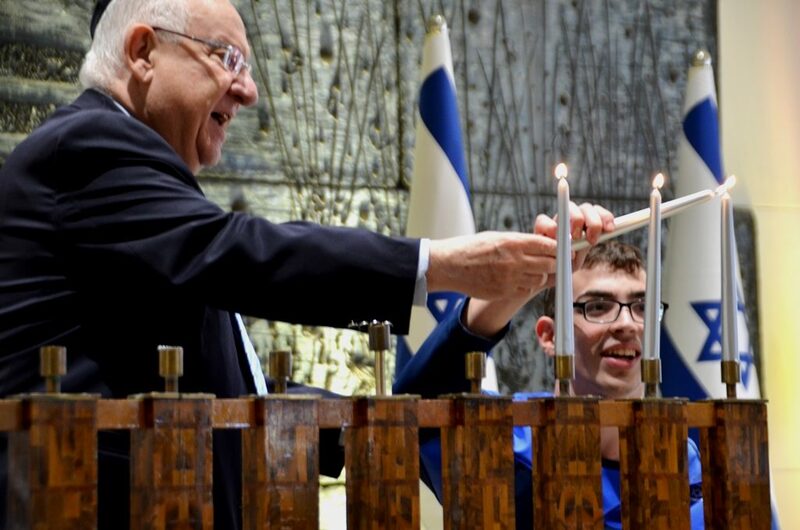 or a large hanukkiah at Beit Hanasi, the Israeli President’s Residence, Hanukkah was a special time. The President hosted multiple groups over Hanukkah, morning and night, to join in lighting ceremonies, including groups of Holocaust survivors and children. 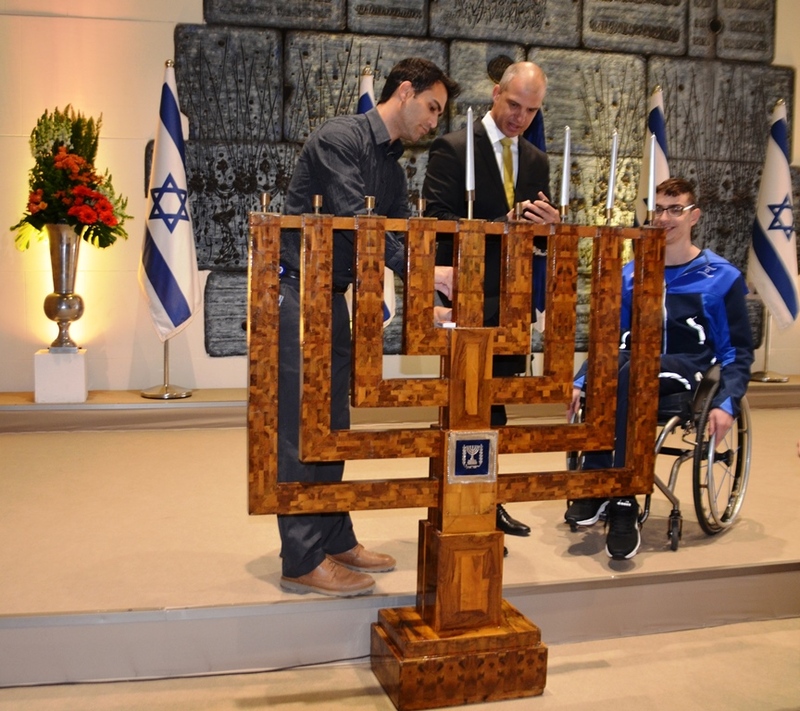 This Paralympic athlete who was honored to light at one ceremony had a favorite smile. 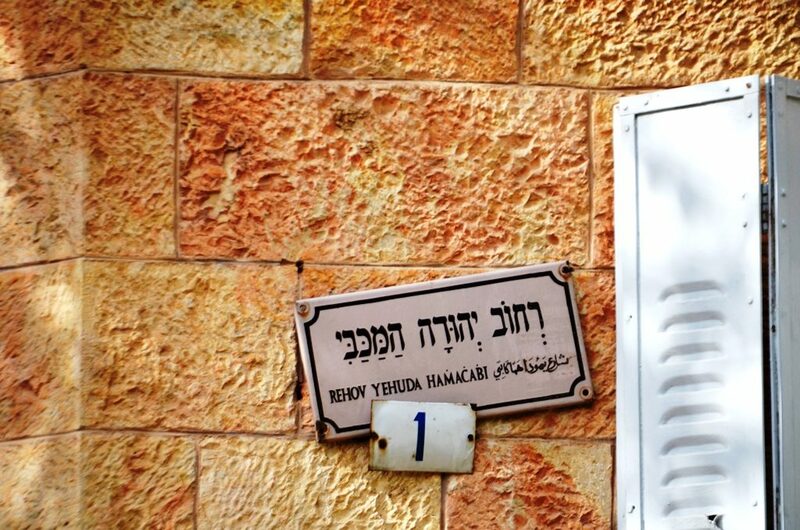 Did you know Jerusalem has a street named for Judah the Maccabee? 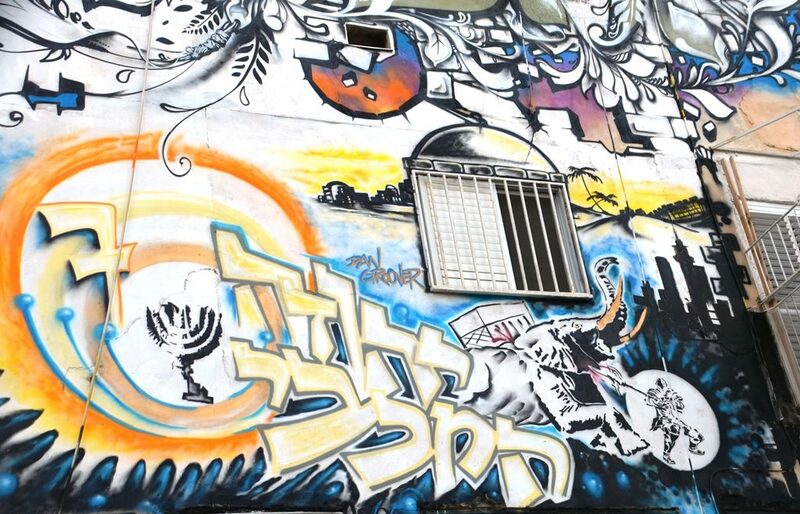 On the building at #7 Judah Maccabee Street was this holiday themed graffiti. 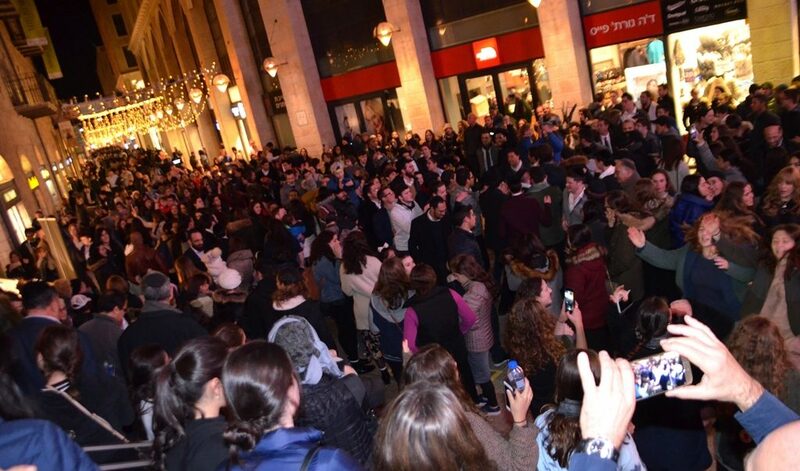 Large crowds were found in Mamilla Mall for candle lighting, with music, singing and dancing. The last night of Hanukkah there was a glorious sky at sunset. You see a glimpse of it to the left. We were on our way to one last Hanukkah party in heavy traffic, and slowed to take this photo. Seems like this cyclist stopped as well, along with the cars slowing to watch. 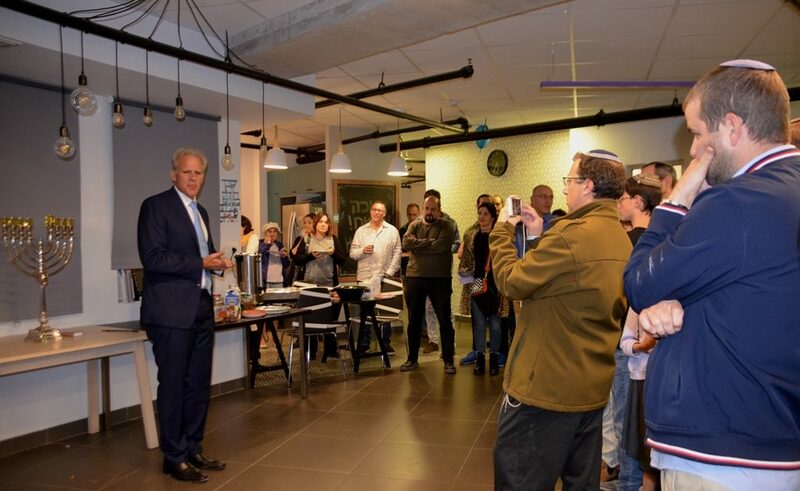 Missed a great sunset photo, but in spite of traffic made it to Hub Etzion in time for Michael Oren to light the hanukkiah and celebrate at the last Hanukkah party for this year. 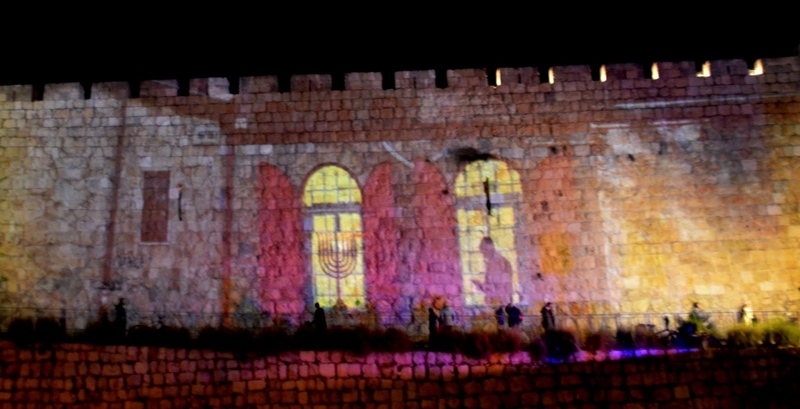 In recent years the walls of the Old City were lit up with projections for Hanukkah. This year again a favorite with Hanukkah greetings in multiple languages. Inside the walls by Jaffa Gate, the Old City was the site of a Hanukkalayim Festival. 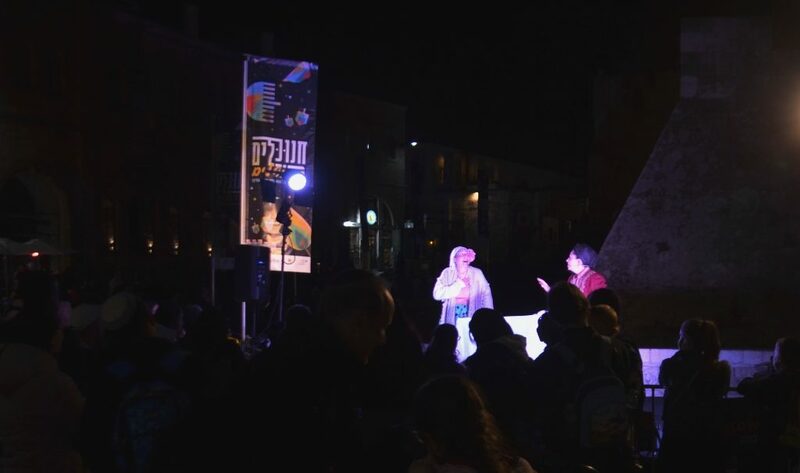 Live performances, music and more lights for Hanukkah. Glad I went on Wednesday night. On Thursday it started raining, pouring, and raining some more. 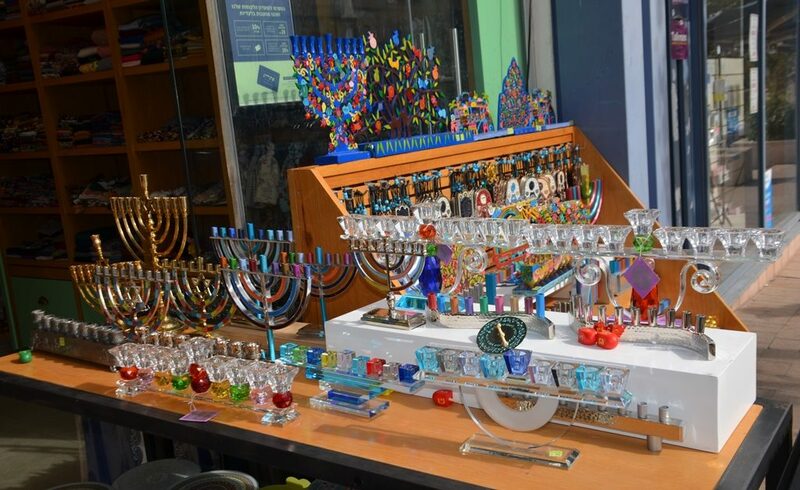 The Bloomfield Science Museum had special Hanukkah fire exhibits and was packed. Other museums were filled as a day at the zoo was not good option. Going to the Israel Museum had been our original plan. Viewing menorahs from 4th – 5th century CE in Tiberias, from the Susiya synagogue in the Hebron hills. 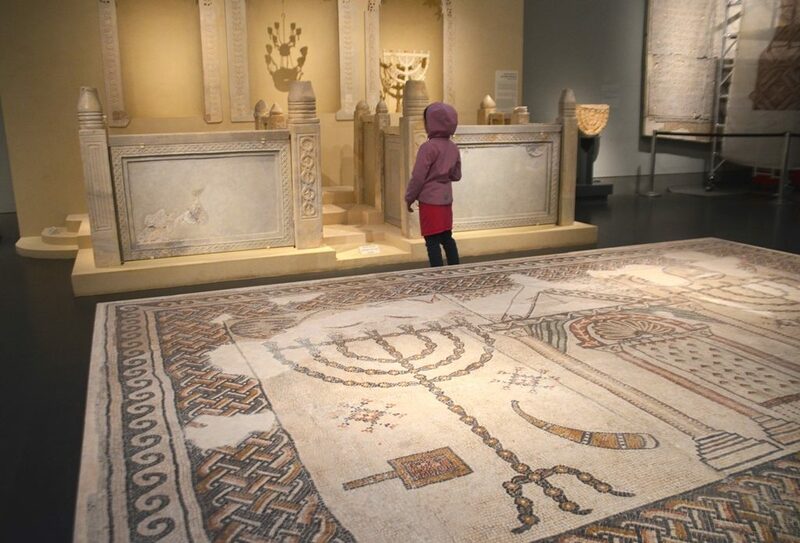 and from Beit Shean in 5th – 7th century CE, our visit fit the Hanukkah spirit perfectly. Thankfully the weather was perfect for the first Jerusalem Hanukkah Together Parade as it went down King David Street. 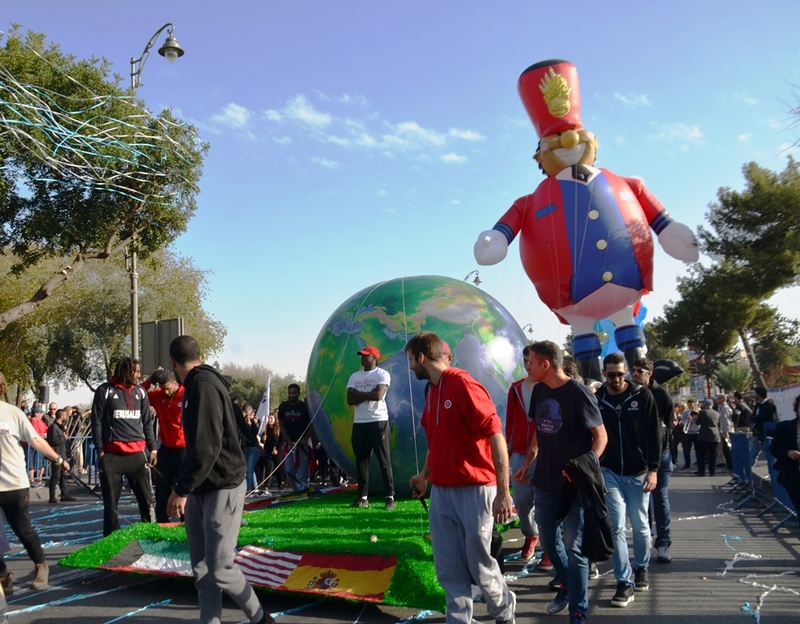 Famous balloons did not include Spider-Man, Kung Fu Panda, Anna and Elsa from “Frozen,” Mickey Mouse and Donald Duck, and Pokemons, but included “others” and Jerusalem basketball players. 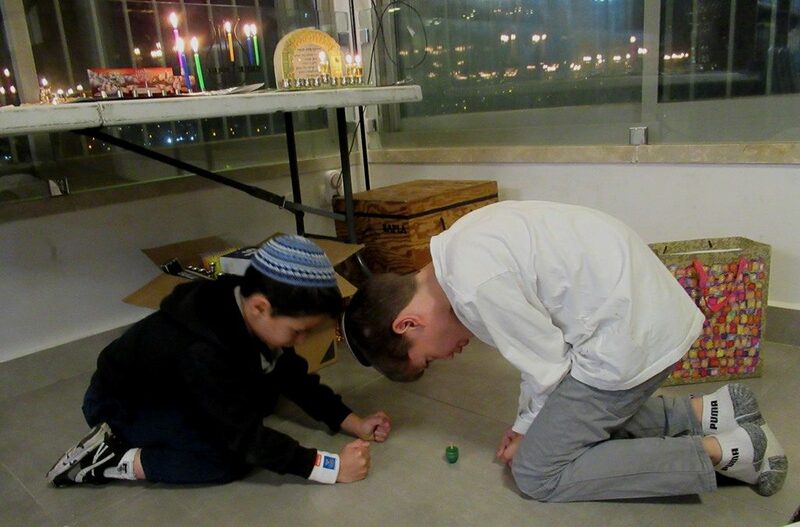 Rain was no problem for a serious game of Hanukkah dreidel. Tons of suffganiot were consumed. 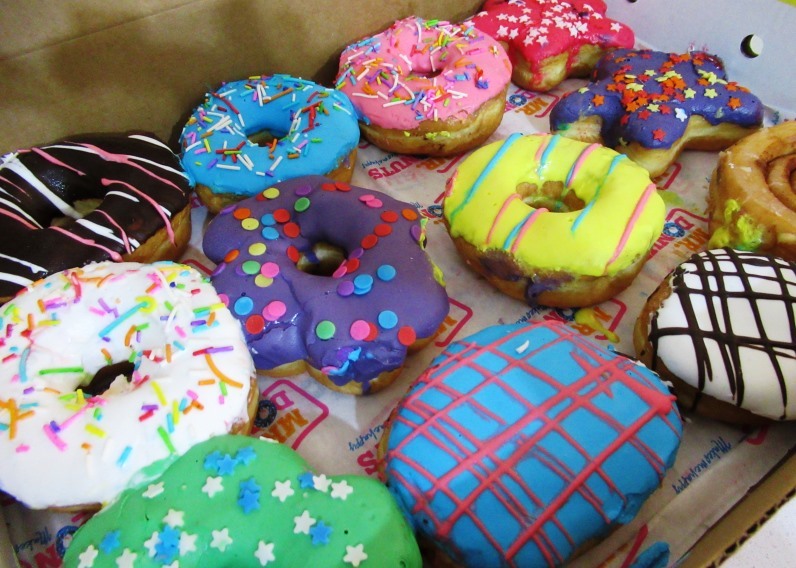 These colorful ones were not a favorite, I prefer a fresh, simple glazed donut. 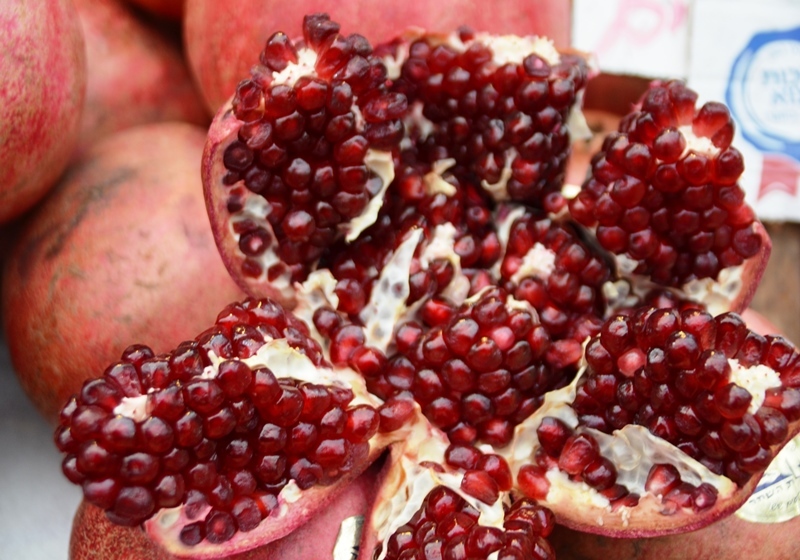 For those wanting a healthier Hanukkah option, there were these any time favorite pomegranates in Machane Yehuda Market, the shuk. 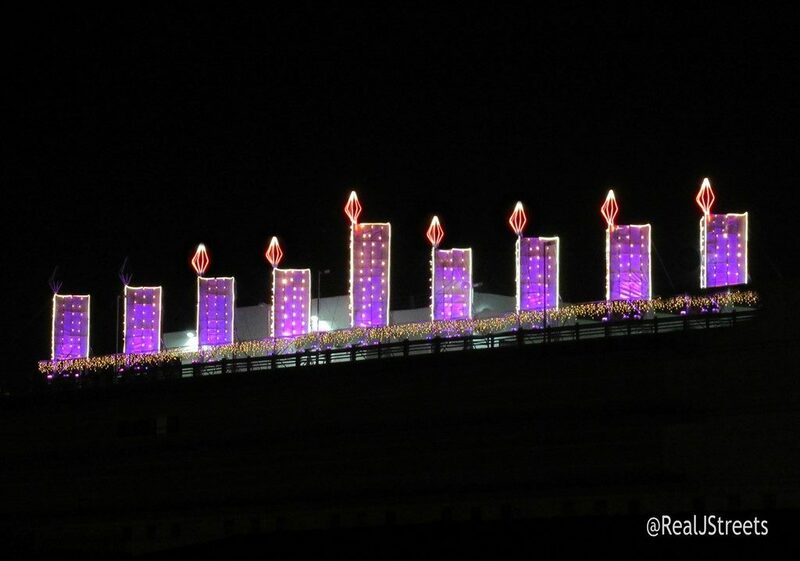 The hanukkiah on top of Hadar Mall, changed colors in this short video. 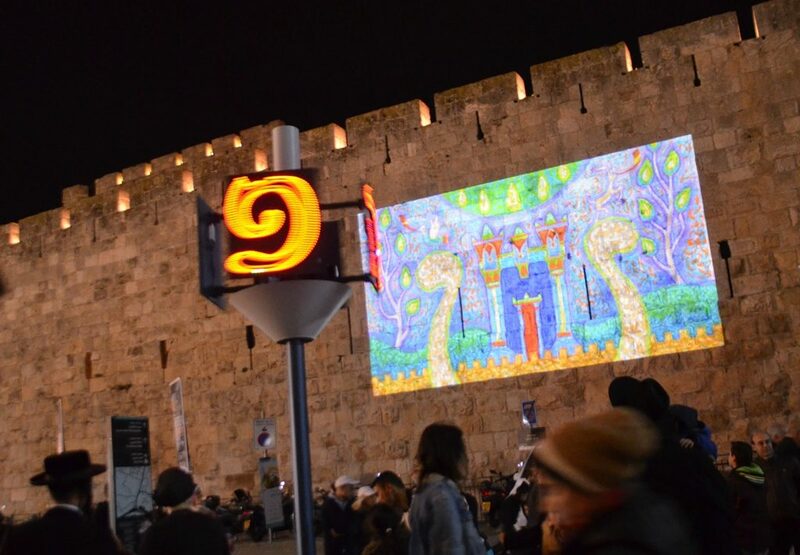 The projections on the walls of Old City near Jaffa Gate also need a video presentation to appreciate why it was favorite. 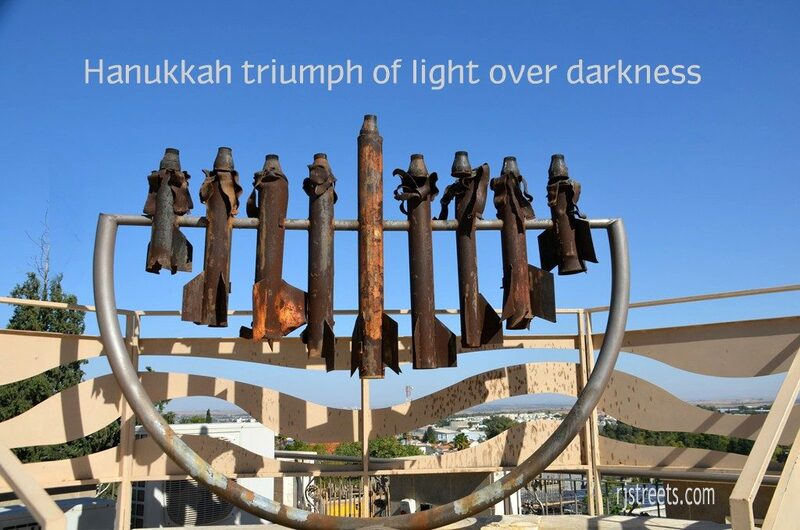 A final favorite hanukkiah is found on top of the Sderot Yeshivat Hesder. 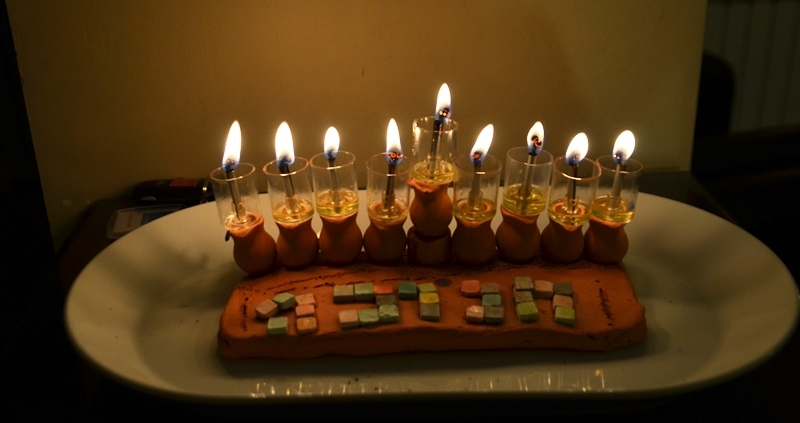 This hanukkiah is made of projectiles fired from Gaza into southern Israel. tens of thousands of burning, shining lights in the night. But big day tomorrow to prepare, better get going. 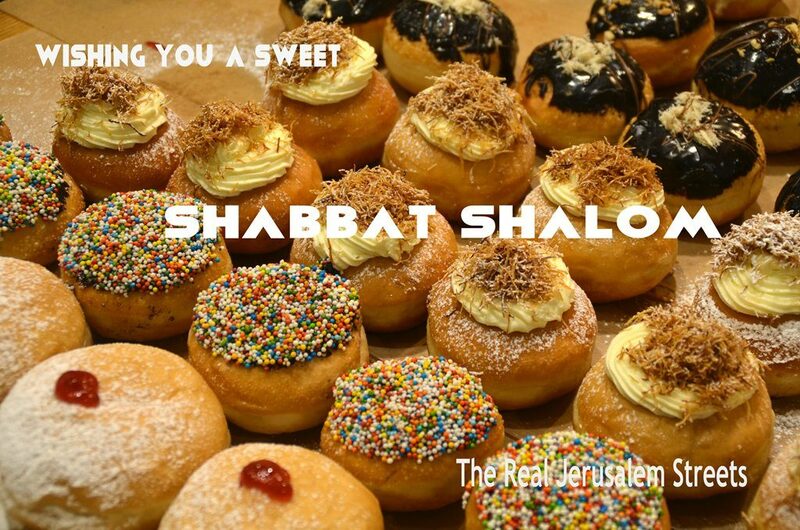 Hanukkah, Shabbat, and new month, a lot for one short day.